We use large-scale molecular simulations to study molecular-level interfacial phenomena in Room Temperature Ionic Liquids (RTILs) with a particular focus on Electrical Double Layer properties in RTILs. HPC modeling tools allow us to achieve a molecular-level understanding of nanocarbon electrode behaviour in solvent-free ionic liquids electrolytes as well as in mixtures of RTILs with organic electrolytes. 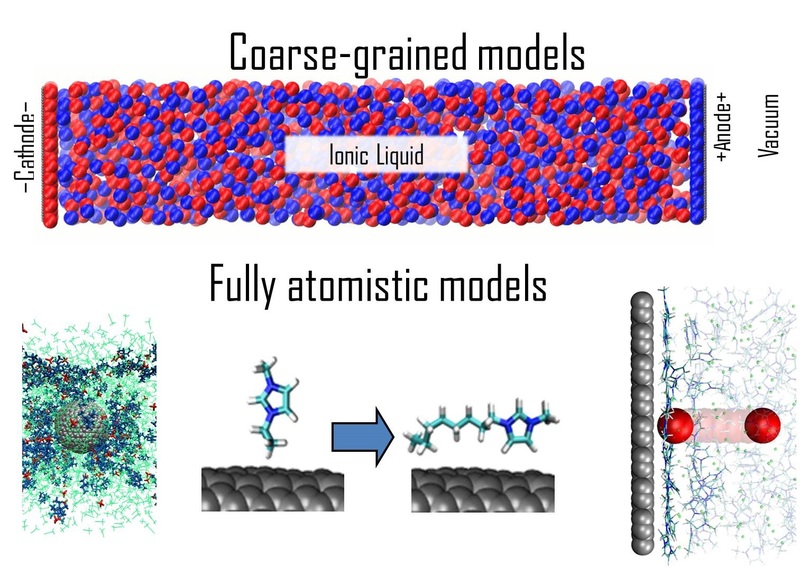 Our efforts include modeling and simulation of equilibrium and transport dynamics in ionic liquids by Coarse-Grain [1, 2] and Fully Atomistic Models [3, 4, 5] to determine the ionic liquid electrolyte structure and dynamics near electrodes. Figure 1. Examples of models used in this project. The molecular-scale studies provide insights into fundamental properties of electrochemical interfaces in RTILs. The results should be important for many applications of ionic liquids where the interfacial effects are important, such as and electrochemical energy storage, electrodeposition of metals, nanoassembling in RTILs, solar energy conversion, biomass conversion, catalysis, lubrication, etc. For more information about the project contact Prof. Maxim Fedorov (maxim.fedorov [at] strath [dot] ac [dot] uk), Professor at the Department of Physics at the University of Strathclyde or Dr Vladslav Ivaništšev (vladislav.ivanistsev [at] strath [dot] ac [dot] uk).